BALL GROUND, Ga., Sept. 4, 2018 /PRNewswire/ -- Global oxygen therapy manufacturer CAIRE Inc. debuted the wearable FreeStyle® Comfort® portable oxygen concentrator this week at its headquarters and respiratory Center of Excellence in Georgia. 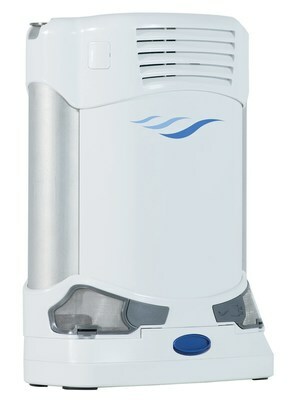 The CAIRE FreeStyle Comfort is a 5 lb., 5-setting pulse flow portable oxygen concentrator designed with an innovative curved shape, an LCD display, up to 8-hour user-replaceable battery, sensitive breath detection and safety technology, and offers wireless connectivity to CAIRE’s telehealth solution, CAIREview™ powered by SynsorMed. Meets FAA guidelines for commercial air flights. Following a quiet, controlled launch with select CAIRE partners, this new 5-pulse-setting prescription device features an innovative comfort curve and weighs only 5 lbs. – well-suited for the approximately 12 million adults in the US diagnosed with Chronic Obstructive Pulmonary Disease, according to statistics from the National Heart, Lung and Blood Institute. "We are proud to introduce the latest in a long line of leading oxygen therapy equipment used in the treatment of those individuals diagnosed with COPD. The FreeStyle® Comfort® blends together durability, clinical efficacy and comfort for its user," said Earl Lawson, President of the BioMedical Group at Chart Industries, Inc. The curved shell of the FreeStyle® Comfort® skims the natural curve of the body and makes it truly a comfortable device to wear in comparison to other concentrators that come in oval and more square shapes that do not offer a contour. Operational via wall outlet power, motor vehicle power, or by rechargeable battery power, the device is designed for travel and is FAA compliant for commercial air flights. The FreeStyle® Comfort® offers glow-in-the-dark buttons and an LCD display screen that shows prescribed flow settings and remaining battery charge. User-replaceable battery packs come in two sizes, 8-cell and 16-cell, and can operate up to 4 and 8 hours, respectively, at pulse setting 2. The FreeStyle® Comfort® delivers up to 1050 milliliters of oxygen per minute and is equipped with sensitive breath detection features and technology including CAIRE's UltraSense™ technology. Also, should a no-breath alarm occur, the device delivers oxygen therapy at its current setting at a rate of 20 breaths per minute until this alarm condition has been resolved. This first of its kind, this smart oxygen concentrator includes wireless connectivity capabilities to CAIRE's telehealth solution, CAIREview™ powered by SynsorMed. This helpful mobile application can provide a critical link between the patient and the provider, dedicated to supporting their respiratory health care needs. For more information, visit your local medical equipment provider, call 1-800-482-2473, or email CAIRE.Request@chartindustries.com.